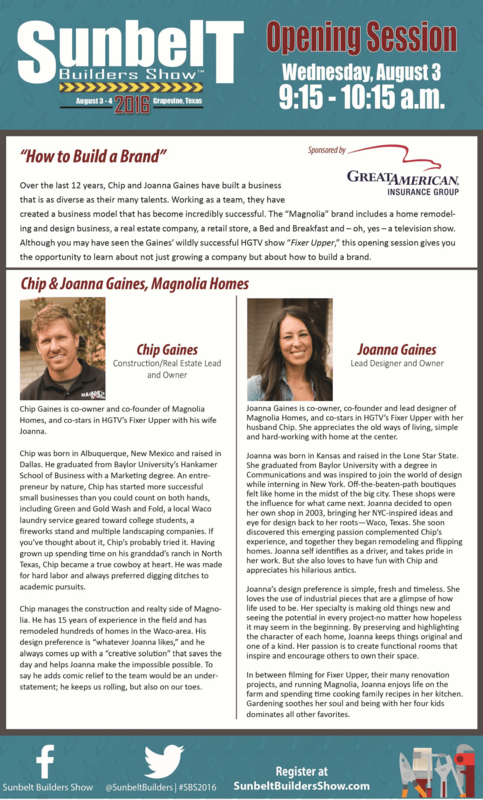 The Sunbelt Builders Show™ is thrilled to have Chip and Joanna Gaines as the Opening Session Speakers at #SBS2016! Members of the Texas Association of Builders, Chip and Joanna Gaines have built a business that is as diverse as their many talents. Working as a team, they have created a business model that has become incredibly successful. The “Magnolia” brand includes a home remodeling and design business, a real estate company, a retail store, a Bed and Breakfast and – oh, yes – a television show. Although you may have seen the Gaines’ wildly successful HGTV show “Fixer Upper,” this opening session gives you the opportunity to learn about not just growing a company but about how to build a brand.